Skinny dip, and an Easter recap. Hello again My Mommy Style readers. We couldn’t be more excited to be here at MMS sharing a few of our favorite recipes, as we kick off My Food Style week. Okay, but are we all a little happy that Easter is finally over and those beautiful, evil little Mini Cadbury Eggs will no longer be thwarting my every attempt to get thin? Don’t you look at me like you have no clue what I’m talking about…and if you really don’t know what I’m talking about, then we cannot be friends. I mean, how do the folks at Cadbury live with themselves? Though the economy may still be in a recession, my waistline clearly isn’t, and they aren’t helping! I suppose they figure it’s okay to add to their bottom line as long as they’re adding to mine. So, while I love these little creations, I hate what’s become of my figure, and so I must sever this love/hate relationship. Mini Cadbury Eggs, you must go, but know that I will think of you longingly from time to time. Dieting, like exercise and hitting your head against a wall, only feels good when you stop…Okay, well, that’s not entirely true, because I actually feel really fantastic when I’m eating healthier, even if there are no visible results. (Though visible results are much more enjoyable) Are any of you struggling to lose weight? Do you even know what I’m talking about? Anybody? Beuller? Beuller? I keep falling of that wagon and having to drag my tush back on, and while I am down in weight, I’m not down enough. Losing the baby weight (or BABIES weight, as I had twins) has been a little more difficult this time around due to my severe anemia from the twin delivery (one was delivered naturally and the second via emergency caesarian). For a while, I really struggled to find energy. I have kind of been in survival mode for a long time. However, I feel like the last month or so I’ve been a little more myself. Maybe it’s the shift in weather, or the increased dosage of iron, but either way, it’s good to be me. Now, if we can just get away from all holidays for a while, I might actually be successful on my fitness regimen. This gorgeous dish, shown just below, is so craveable! It’s my Skinny Dip! 1 package reduced fat (or no fat) cream cheese (If you do weight watchers, they have their own brand, which I do use). Place Cool Whip in fridge the night before to thaw. Pull out your cream cheese about 30 minutes prior to making. You want it soft and I never have great luck getting the right consistency if I try to soften in the microwave; so this is my fool-proof way of making this dip. Place cream cheese, Splenda and vanilla in your mixing bowl and mix at medium speed, scraping sides often, for about 1-2 minutes (a bit longer if by hand). Slowly add cool whip. 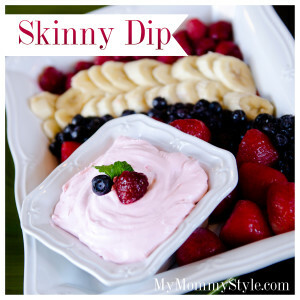 For a splash of color to your Skinny Dip, toss in a handful of berries, which will give your dip a light pink shade. Voilà ! Enjoy over fruit, pancakes, oreos…wait, not oreos…I’m pretty sure that’s not allowed on my diet. (But it is good!) this dip pretty much goes with everything! I take this to every party and it’s always a huge hit, and that way, if I am trying to eat healthy, I know there will be something there for me to eat. As you can see, it makes a gorgeous dish. To happy, healthier eating and a happier, healthier us! Ps: I am ALWAYS on the lookout for great new healthy recipes so please share if you have any favorites…please…pretty please. You’re killing me smalls! This looks amazing! Thanks so much for linking up to Monday Funday this week… we will be featuring you tomorrow!